At ETC Hire we’re dedicated to being at the forefront of the traffic control equipment hire industry, to ensure the highest safety standards are maintained during road and civil works, which is why we’ve introduced Gold Coast and Brisbane pedestrian traffic lights for hire. Our hire team also service Ipswich, the Sunshine Coast, Byron Bay and Northern New South Wales. We are proud to be the main hire company in Australia that supplies this mode of portable traffic lights for temporary pedestrian crossings. Our pedestrian traffic lights meet the national safety standard AS4191 and are Australian-made, so quality and reliability is guaranteed. So that our pedestrian traffic lights are mobile and easy to transport, all units have been trailer mounted. 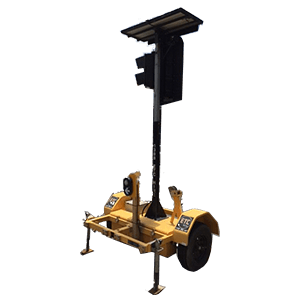 The portable traffic lights are also completely solar powered, enabling 24/7 operation with no ongoing running costs and zero emissions. Our pedestrian traffic crossings have high quality LED screens, for superior visibility in all conditions. This also means the lights have a greater impact with pedestrians, ensuring safer navigation of pedestrian crossings where road and civil works are being conducted. We have portable pedestrian traffic lights available that are configured for both single and dual carriageways, depending on whether you require temporary pedestrian crossings for works on single or multi-lane road systems. Our pedestrian traffic lights will also stay green until pressed, so these won’t hold up the regular flow of traffic. When activated, the lights will automatically go red, so pedestrians can navigate the crossing as soon as the light changes and they hear the traffic crossing signal. Contact ETC Hire on 1300 382 447 to arrange for pedestrian traffic lights on your next civil or roadworks project in Brisbane, the Gold Coast or surrounding areas.